FootyFair: You spent a number of years playing in Switzerland with FC St. Gallen, Servette and FC Zurich. What are the major differences between Swiss football and the game in North America? Eric Hassli: Major League Soccer is more physical and athletic than Switzerland, but Switzerland is way better technically and tactically. Here in the US you don't have the relegation system and 2nd division so there is not a lot of pressure around teams. In Switzerland it was the opposite, but MlS is growing really fast! 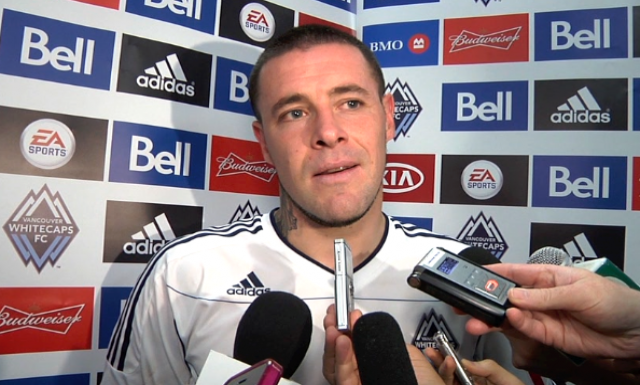 FF: In 2011 you made your debut in North America with the Vancouver Whitecaps in the MLS and you have been playing on the continent since then. In which city did you feel most "at home"? EH: Lifestyle, football fans, teammates, in North America is VANCOUVER by far! I had a blast over there and thought I would finish my career there. And I met my "brother from another mother" Davide Chiumiento there, so Vancouver will always be special for me. Otherwise, in Switzerland it was Zurich. A great organization and the fans were amazing to me! FF: In 2012 you were nominated for the FIFA Puskás Award for your incredible goal with Vancouver against the Toronto FC. How did it feel to be considered for the award among other footballers such as Neymar, Radamel Falcao, Lionel Messi, Hatem Ben-Arfa and eventual award recipient Miroslav Stoch? EH: I was nominated for the FIFA Puskás Award with the volley goal and it was great to be in competition with the best soccer players in the world, but being nominated to the ESPYS was also crazy awesome! I had a chance to meet some great people such as Ray Allen, Tim Thomas and George St Pierre. Below you can see two incredible goals from Eric Hassli, including the one against Toronto which earned him the nomination for the 2012 FIFA Puskás Award. FF: We heard that you may be somewhat of a Chelsea FC fan. Who is your all-time favorite Chelsea footballer, and who do you think currently is the best player on their squad? EH: Drogba was a beast! I think hazard is the best even if he has a little hard time right now but this kid is unbelievable. And of course Lampard is a legend even though he plays for Manchester City now. FF: Have you had routines or superstitions before, after or during football? EH: Yes. I have my shin-guards with the name of my kids and I have to have my number 29. FF: You were born just outside of Metz and played for the club in the beginning of your career, did you support the club when you were younger, or are you a fan of another club in Ligue 1? EH: FC Metz was the club of my father, I like it too but I was a fan of Olympique de Marseille with Enzo Francescoli, Carlos Moser, Basile Boli, Abedi Pele and the best CHRIS WADDLE!!!! FF: On Thursdays we do a "Throwback Thursdays" piece talking about interesting and fun football events from the past. What is your favorite football memory? EH: Outside my own career I would say Olympique de Marseille winning the champions league versus AC Milan on may 26th 1993, and of course France 98 world champions. FF: We know you are a big fan of ink and so are we here at FootyFair.com. When did you get your first tattoo and what was it? EH: I got my first tattoo in my hometown (Sarreguemines) when I was 15 or 16 and the tattoo was a Chinese sign that says Strength and power (hopefully ;-). FF: You are known as a player who says it "as it is". From the clubs you have been with throughout your career which would you never return to? EH: I had good and bad experiences but I would comeback to every club. I don't have a hard feelings. I started my career with FC Metz and it was fantastic at the beginning, but I got released like a peace of bread (editor's note: this must be a French saying, lol), but I love this club no matter what. I was young too. FF: Who was the most inspirational manager/coach in your career? EH: I had great coaches: Joel Muller, Jean Fernandez, Antoine Kambouaré, Gordon Strackan.. And now a young and talented one Alen Marcina. I had one Technical director in Zurich (Freddy Nickel) he was very special for me! Always having my back and he knew how to manage me, I'm sensitive. I need people to trust me to succeed and he brought the best out of me. We would like to thank Eric Hassli for taking the time to answer our questions and wish him the best of luck in football and his personal life.